People will ask, “Why the double nosebands and double cross under straps?” The answer is found in the history and development of the bridle. We preferred riding in a simple rope halter, but found that when a single rein was pulled, the noseband would twist on the head of the horse. Upon further research, we found that all bitless bridles had this problem of twisting on the nose. This twisting action is usually counteracted through the cinching down of a chin strap and/or throat latch underneath the jaw. So, we began a mission to develop a bitless bridle that did not twist when a single rein is pulled. We utilized the common bitless bridle cross under strap design, but added a second noseband which created a new set of pressure points. 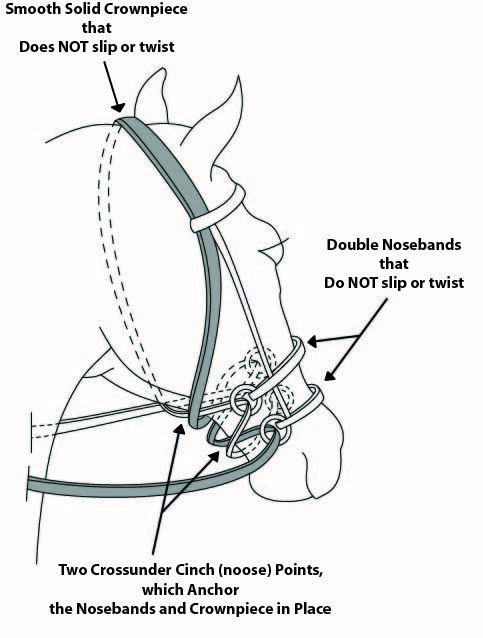 This design distributes pressure between the two nosebands and equalizes pressure on opposing sides of the jaw, which totally stabilizes the bridle on the head. It will literally never twist when a single rein is pulled because the pressure is equally balanced on both sides of the nose. This design also focuses more pressure on the nose, and much less pressure up to the poll, unlike other similar cross under strap type bitless bridles.